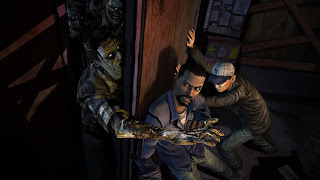 Thanks to Telltale's The Walking Dead game, we see the return of a genre that has been long forgotten, now given new life and energy. The critical acclaim of late 2012's The Walking Dead sees the return of an age old genre of gaming and storytelling - the adventure game. The series, based on the popular TV show of the same name, has done very well commercially and critically and although I haven't had the chance to actually play the game yet myself, it begs the question, what happened to games that made you think? Like many of the classics I grew up playing, I don't remember how, when or why we owned this game, simply that it existed and it was good. So good in fact, I usually find myself comparing other point and click games that I play to this masterpiece to gauge how good they are. The story is quirky, funny and not too dramatic. But that's a good thing. A green and purple tentacle (remember when I told you it was quirky?) are taking a stroll one day when the purple one ends up digesting some strange toxic waste which instantly turns him into a deranged and evil genius intent on controlling the world. This takes our three heroes Bernard, Hoagie and Laverne on a journey through the past, present and a dystopian future to make sure the purple tentacle fails in his plans to make the Human race his slaves. The game is rich in humour, mystery and brain-racking puzzles that will keep you playing for hours until you reach your goal. 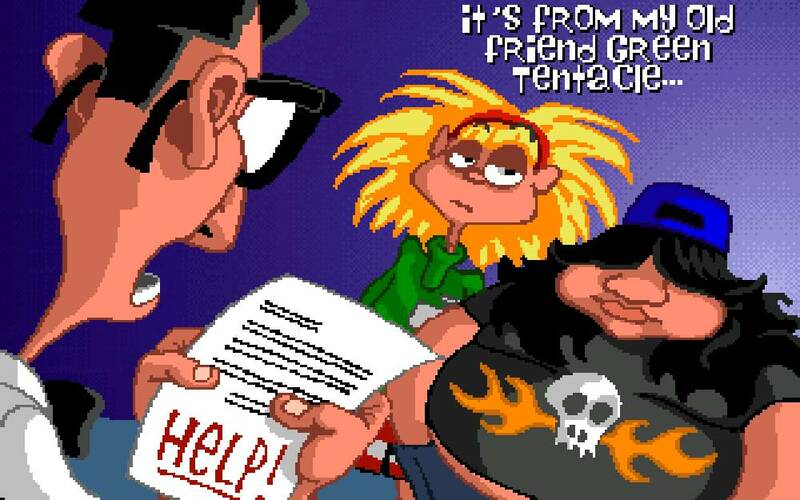 In my opinion, this is the adventure game genre in all of it's golden era glory. With the recent closing of LucasArts studios, the one game it made me reminisce on is this one. I owned Broken Sword for the Playstation 1 and I was as addicted to this game as I was Day of the Tentacle. 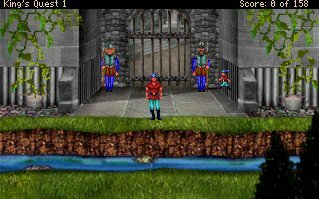 A much darker and more mature storyline than the previously mentioned game, the antagonist here is a mysterious serial killer who carries out his assassinations under many different disguises, the first of which is a sinister clown costume that he wears at the beginning of the game while blowing up a Parisian café. It is up to American journalist George Stobbart to take down the murderer who, after witnessing the first massacre himself while sat outside the café takes it upon himself to be the hero. This is no easy feat however as all George has is his own quick wit. You will have to search low and high for clues throughout the investigation that takes you all around the world from Paris to Ireland. There is plenty to do and this is not a short game in the slightest. Every time you get a puzzle right or successfully hunt down a clue the feeling is a hundred times more satisfying than any headshot in a FPS could ever be. Although I must admit I still haven't completed this game, so I think I'll have to do some hunting around of my own to find my old copy of the game. Unlike the previous two games I've mentioned, I'm actually quite new to this series which made it's debut way back in 1984, making it the oldest series on the list and one of the precursors to modern adventure video games. Although the original used a text based system where the player had to type commands such as 'PICK UP DAGGER', there has since been a series of remakes by a company called AGD Interactive which boast improved graphics, a point and click interface instead of a text-based one and even improved storylines and extended puzzles, as well as added voice acting and upgraded music. This makes it much easier for someone new to the series to jump in on, especially as now it's a lot closer to the kinds of adventure games I'm used to as well as having an upgraded experience to enjoy. I'm already on the second game, and I'm enjoying the ridiculously challenging puzzles and the funny pop culture references. The Batmobile definitely did just drive out of that cave, I wasn't dreaming. The remakes of the first three King's Quest games can be found for free download on their website here! LucasArts also gave us another brilliant adventure game franchise with the Monkey Island series. 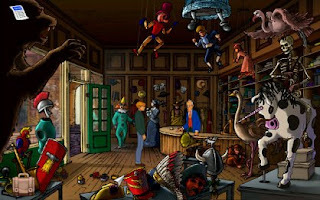 In particular, I enjoyed Escape from Monkey Island, one of the few games of it's kind to be found on the PS2 as well as the point and click format of choice, the PC. The swashbuckling hero Guybrush Threepwood has a lot in common with some of the protagonists from similar games. Like Bernard from Day of the Tentacle and George from Broken Sword, Threepwood never gets bored of breaking the fourth wall and speaking to the player to make a joke and his wit is virtually unmatched. Escape from Monkey Island manages to be a point and click game as well as combining action elements for some sections and great 3D gameplay. The voice acting is top notch and the humour and script are spot on. Because of the fluid gameplay and graphics that are easy on the eye, I'd definitely recommend this game to a point-and-click newbie regardless of the fact that it isn't chronologically the first in the series, because that doesn't really matter too much with this franchise. 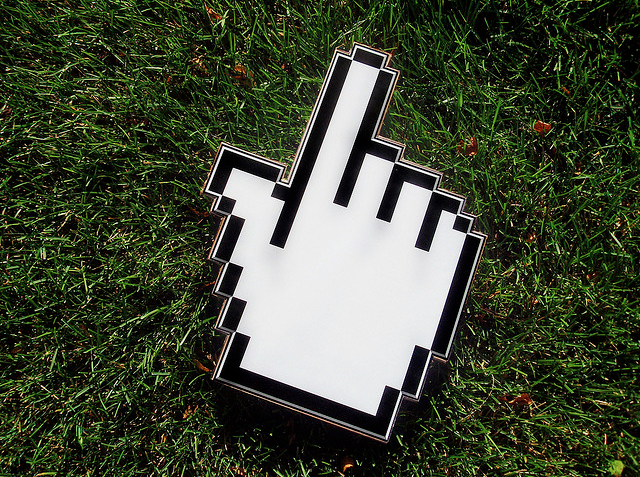 If there are any point-and-click games you fell in love with, tell us about them in the comments below!